Waistbands and belts for weight loss appeal to individuals looking for an easy way to get slim. The devices use a technology called electronic muscle stimulation to give the abs a workout without actually exercising. Brands of weight-loss waistbands include the Slendertone Flex Belt, Contour Abs Belt and EMS Slimming Belt. Although the belts may have some benefits, the FDA has not approved any of the devices for weight-loss purposes. Instead of exercising the abdominals, you are instructed to put the waistband around the stomach. 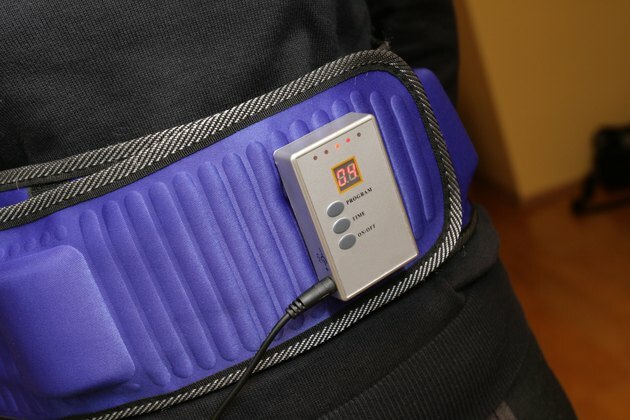 After turning on the device, electrical currents are sent through the pads of the belt to stimulate the abdominal muscles. This forces the muscles to contract. Repeated stimulation in this manner can build muscle strength and toning. Each session lasts approximately 30 minutes and you are instructed by the manufacturer to wear the belt at least three times per week. The FDA has approved the Slendertone Flex Belt for strengthening and toning the abdominal muscles. However, the waistbands will not promote weight loss or girth reduction when in use. Nor will you have six-pack abs with regular usage, since spot reduction is not possible. There are side effects that can occur when using the weight-loss belts, including skin irritation, burns, shocks and pain during usage. If you suffer any side effects while using the device, discontinue and consult a physician. Do not use the belt if you have a pacemaker in place or an IUD. Also, avoid it if you are pregnant or suffer from a serious medical condition. You should also consider avoiding devices that do not have FDA approval. These belts may have safety concerns, like unregulated cables. Instead of spending hundreds on a weight-loss waistband, consider traditional methods to lose weight and tone the abs. If you want to lose weight around the belly area, you need to make time for regular cardio exercise and reduce your calorie intake. Also, spend three to four days a week performing core training exercises such as crunches, planks, bicycles and pelvic lifts.